Congress reacted swiftly when furloughs of FAA air traffic controllers caused a surge in flight delays. But even without the cutbacks, travelers at these airports feel lucky when they depart on time. 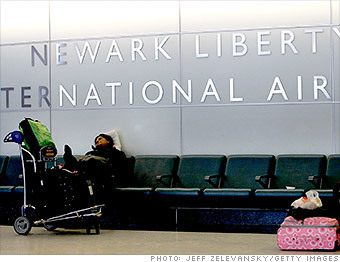 Newark Liberty regularly ranks among the airports least loved by travelers. In 2012, it had the worst on-time departure rate of any of the 29 major airports tracked by the Department of Transportation. Nearly 29% of flights met with delays of 15 minutes or more. Even worse, only 69% of arrivals came in on schedule. That stat does contain some good news, however. It was a nearly a three percentage-point improvement over 2011. Many of Newark's flight issues were caused by what the Department of Transportation classifies as National Aviation System delays, which cover such factors as heavy air traffic, gate shortages and air traffic control problems.